My wardrobe looks like the fashion monster has thrown up all over the place. Not mess wise... ok yes probably, but mostly because I have one off outfits that I struggle to wear more than once. Not because i'm to dang fancy to wear something twice, because it just doesn't go with the next random piece of clothing I have. Over the years I have been buying clothing that is "so hot right now" but isn't to flash a few months later. Don't get me wrong, I think it's great to spoil yourself once in a while and buy that dress that you'll probably only wear once but will tell yourself you'll wear again. Don't kid yourself... we're all friends here. Now that I have described to you what exactly my pit of clothes closet doom looks like, I'm going to bring you all the way back to...... basics. I need to get back to basics. I need to re-build my wardrobe, not physically of course, just what is inside it. I want to start purchasing items that I am most definitely going to wear more than once. Lets start a list shall we? I'll start listing things that I think would be essential in my Build-A-Wardrobe & then you add to that list? Cool? Ok, glad we sorted that. 1. A great pair of blue jeans - Jeans are such versatile item to own. 2. Black jeans - because sometimes, I just need to feel sleek in all black. 3. 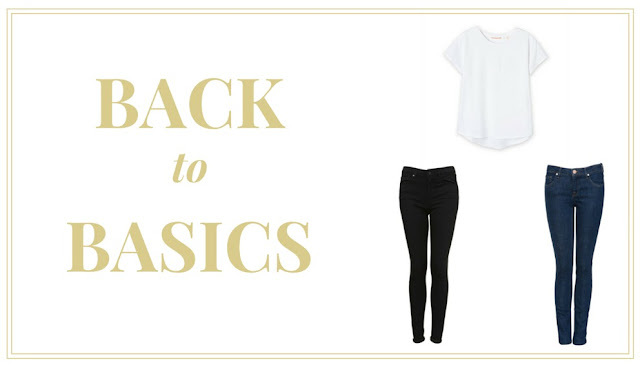 A plain white tee - Look, we've made two outfits already! Ok, now your turn. What do you think is essential item to have in your closet?